I decided to review these books together as they focus on how society makes 40something women about their life choices. Both characters in who you think I am and All Grown Up question their place in a patriarchal society where they choose not to check off the boxes like most people. These women aren’t embracing motherhood and being partnered up. They question their value and place in society. Both novels read as feminist meditations on how unmarried women over 40 contribute to society and where they might fit in when societal standards dictate woman over 40 aren’t supposed to be living independent and solitary lives. In reading these novels I found both characters possessed qualities to which I could completely relate: the odd woman out who chooses that less-traveled path. Perhaps these women aren’t completely satisfied with their imperfect lives but they’re doing their best and they’re fighting stereotypes along the way. Both women aren’t quite sure where they belong. Both women strive to be comfortable in their bodies. By literary standards one would define these characters as unlikable. Both are easily relatable in varied ways. I’ve never been married and don’t have children and don’t always feel grown up despite being in my 40s just like Andrea Bern in All Grown Up. Like Claire Millecam in who you think I am I often feel undervalued, unwanted and misunderstood. Also I’ve done a considerable amount of online dating/ meeting men online. Both women approach their circumstances in different manners. Authors Camille Laurens and Jami Attenberg utilize a sharp, witty tone to make these immensely readable and provocative novels. Both novels, although short, are packed with insight and intelligence. In who you think I am, Claire Millecam, a 48-year-old divorced teacher, poses as a 20something online in order to befriend a younger man who happens to be her boyfriend’s friend. They end up having a relationship and later on her catfishing, I guess you could call it, gets exposed. Claire flipped the switch on what someone expected of her and created the woman that she felt she needed to be at that time. In All Grown Up, Andrea Bern gave up her dreams to be an artist to take a salaried position in advertising. She lives in an apartment in New York. Her friends are getting married and having children. She rotates through lovers. She does drugs. She feels pain while living somewhat messily and unapologetically. She’s in a safe spot professionally and socially which fits her goals and interests. Her work isn’t challenging but it’s steady and consistent. She isn’t committed to any one man and maintains her independence. She’s coping and she’s living a life that makes sense to her. In the meantime, everyone she knows seems to be changing their lives or moving around and doing new things while she remains in the same place doing what she’s pretty much always done. Her brother and sister-in-law move to rural New Hampshire to care for their terminally ill child. Andrea’s mother moves up there to help them leaving Andrea feeling abandoned. This brilliantly written novel features deft characterizations and dark humor. 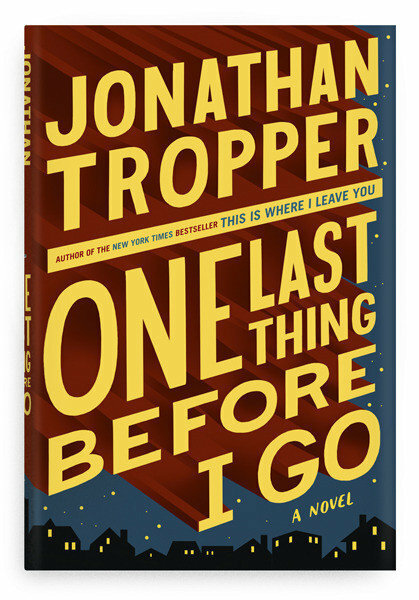 One Last Thing Before I Go by Jonathan Tropper. Publisher: Dutton (August 21, 2012). Contemporary fiction. Hardcover. 336 pages. ISBN: 978-0-525-95236-7. Jonathan Tropper is definitely one of my favorite contemporary male authors. When I heard he had a new novel coming out, I quickly requested a copy and immediately read it. 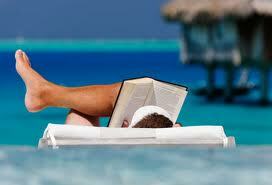 Tropper writes about flawed, failed GenXer men with a sensitive understanding, a witty edge and an insightful flair. Silver is a divorced musician. A one-hit-wonder. He tasted the fame. Now he plays weddings. His ex-wife will soon re-marry a doctor. He lives in an awful apartment building crawling with other divorced men. His teenage daughter Casey shows up to announce she’s pregnant. Casey’s the class valedictorian and en route to Princeton. So to say this is irresponsible behavior for his 18-year-old daughter remains beyond hyperbole. When Silver finds out he’s dying of a heart condition, he sees it as an easy out. Or is it? I found both the pregnancy and the medical condition to be strange plot lines that I both couldn’t get past and couldn’t stop reading about. Tropper writes that well. His character and dialogue can move past any ridiculous plot. If the plot-line had been better I’d have liked the book better. Who chooses to opt out of a heart condition at 43 because he’s not sure he wants to keep on living? I can completely relate to what Silver means but having that hang over your head at all times– wouldn’t one be completely anxiety-ridden? Tropper incorporates it as an additional character, or the fifth dimension or something to that effect. It’s somewhat ridiculous and the other characters realize it but analyze it and philosophize about it just the same. I’ve decided I won’t read novels that revolve around a pregnancy from a one-night-stand as it’s so unrealistic in 2012. As the novel’s about Silver, Casey’s pregnancy isn’t a major plot-line but Tropper handles it deftly. Fortunately Tropper’s smarter than other authors and excels at the craft. Both parents torment their daughter and mention how ridiculous she was not to use protection. Kudos to Tropper for mentioning abortion and detailing scenes with the parents on this. He’s realistic about teenagers. Regret? Through Silver, Tropper shows that we can’t really regret what’s already been done. What’s past is past. The reader begins to comprehend the desires, insecurities and nuances as the Band-Aid gets ripped off at an excruciatingly slow pace. One Last Thing Before I Go had a few annoying bumps but mostly warm and fuzzy moments and humorous anecdotes about a man-child figuring out whether to move forward or let go. It’s about being happy with the here and now. Not settling. Not giving up. But being in the moment. Being present. And that’s never easy at any age for anyone.